Barcelona is not only enjoyed with the eyes, but also at the table. We don’t say it ourselves, since Catalan cuisine is subject to all kinds of scrutiny. Without going any further, a Catalan restaurant, El Celler de Can Roca, has been in the top three in the world for almost a decade, according to the ranking that’s produced annually by the prestigious Restaurant magazine. In addition, the Ciudad Condal has a dozen long distinguished restaurants with one or more stars in the Michelin Guide. Hence, this top 10 of typical dishes to try in Barcelona. 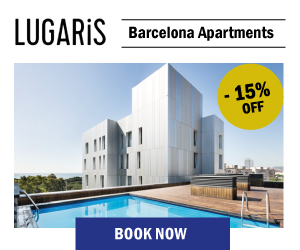 In our rental apartments next to the beach of Barcelona, you have everything for an unforgettable Barcelona vacation. In any case, we don’t want you to stop enjoying the most genuine flavors of Mediterranean cuisine. And for that, we encourage you to discover a symphony of traditional recipes that are a real gift for the senses. Bon Appetite! 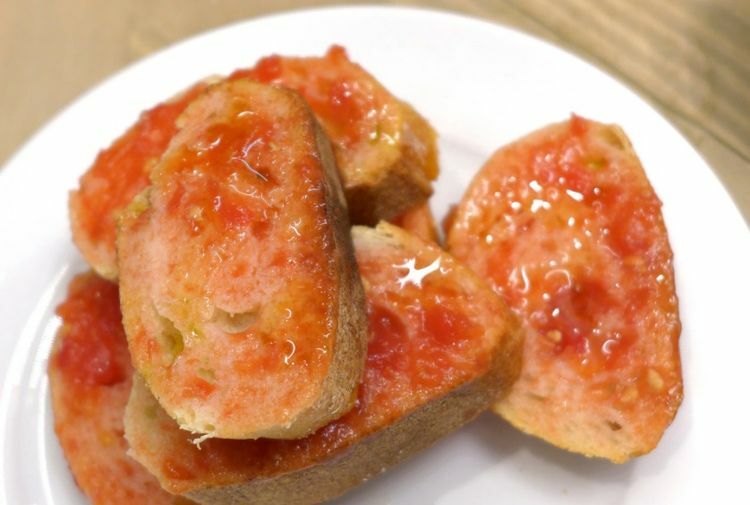 Although it can also be found in other parts of eastern and southern Spain, few dishes are as representative of Catalan cuisine as bread with tomato, perfect to accompany any lunch or dinner. Documented from the end of the 19th century, it is said that it was the Murcian immigrants who came to work on the Barcelona subway works who introduced this very simple appetizer. While there is nothing to certify this theory, it is believed that the fact of rubbing a tomato on the crumb served to reuse the hard bread from previous days. A splash of olive oil and a little salt give the ideal touch to a treat that is always appetizing. 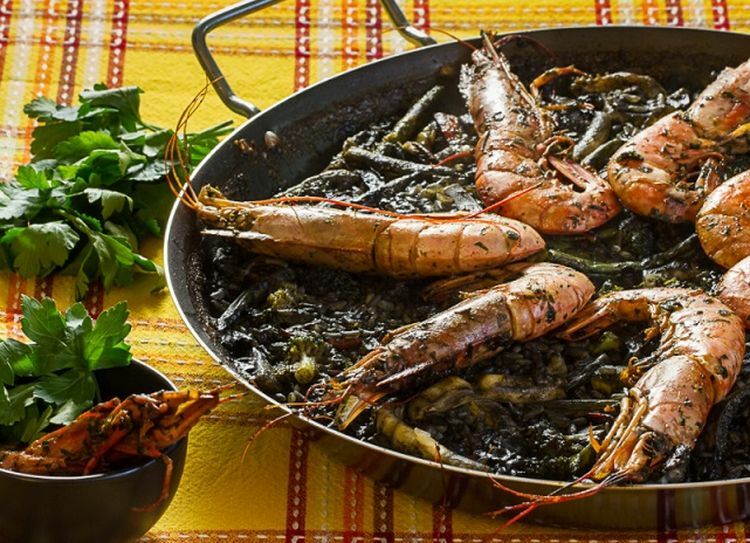 It is a must in winter, and especially in some municipalities south of Barcelona: for example, the town of Valls, considered the birthplace of the calçot. As in the previous case, it is a very simple recipe, consisting of chives cooked on the grill wrapped in newspaper to retain heat better. The outer layer of these vegetables is removed before consumption, using plastic gloves to avoid getting your hands dirty. Yes, it’s exactly how you’re thinking: calçots are eaten without plates or cutlery. While this is not the best plan for a romantic getaway to Barcelona, we guarantee that you’ll be liking your fingers (literally). But if this simple preparation is delicious, it is no less scrumcious than the romesco sauce with which it is accompanied. Typical of the province of Tarragona, it is made out of tomato, fried bread, hazelnuts, garlic, chilli or pepper and olive oil. This is probably one of the most popular dishes to try in Barcelona, so what are you waiting for? 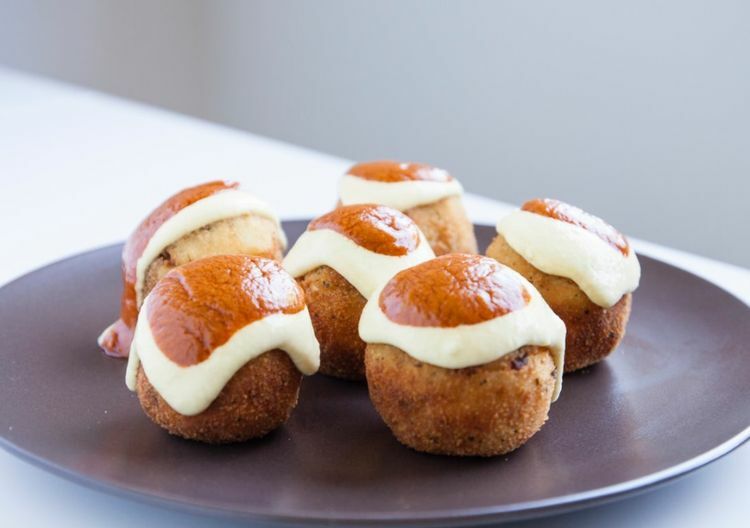 Born in the seaside neighborhood of Barceloneta, close to our rental apartments in Barcelona, Bombas are one of the most irresistible tapas in the Catalan capital. They are basically meatballs of mashed potatoes and meat served with spicy sauce. Why haven’t you asked for them yet? You will find them in most of the best tapas bars in Barceloneta. Enjoy! 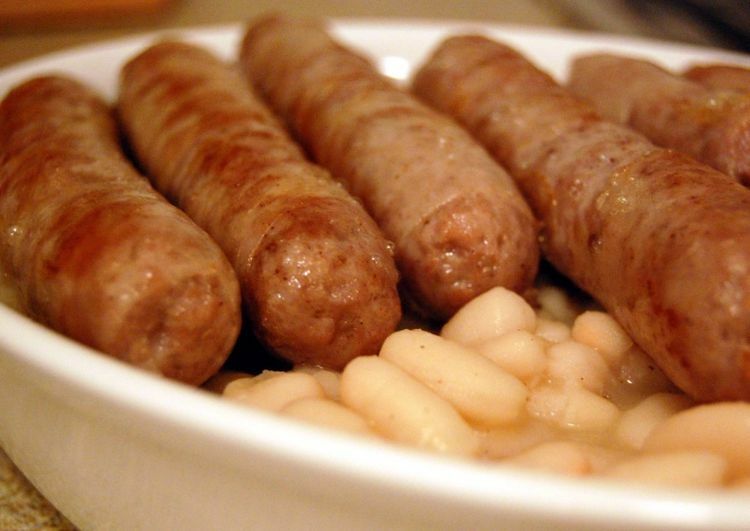 This typical dish to try in Barcelona is the triumph of simplicity, as it combines grilled sausage with the vegetable protein from beans. It is not a very suitable option for those who wish to keep their diet under control, there’s no doubt about it, but we are convinced that you will fully enjoy its flavor. 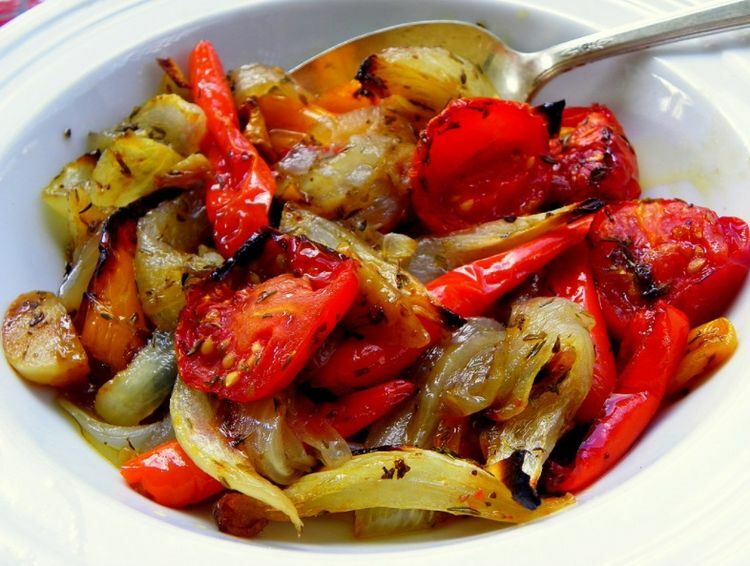 Catalonia shares this delicious vegetable dish with regions such as the Valencian Community, Aragon or Murcia. The formula is simple: a delicious combination of aubergine, pepper, onion and roasted tomatoes. The escalivada is a traditional dish from Catalan cuisine. 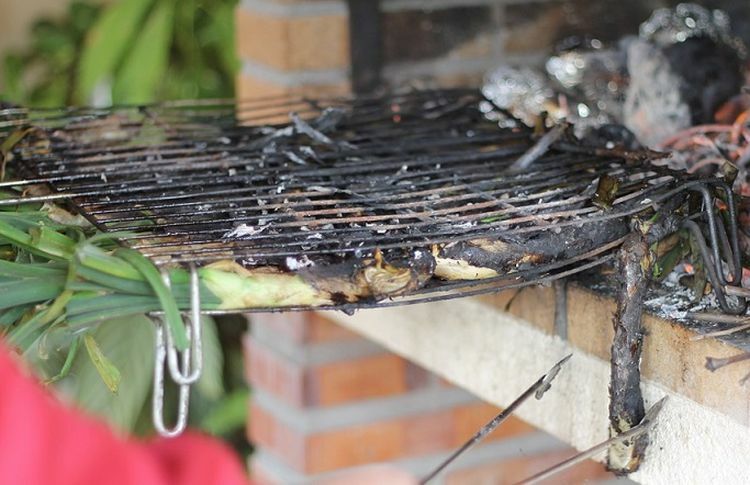 Its name comes from the verb “escalivar” in the Catalan language, which means to cook over embers. Go ahead and try it! Rices are one of the main dishes in the Catalan recipe book, especially in the Empordà area. And among them, black rice stands out, a kind of seafood paella with cuttlefish ink, seafood, tomato, onion, garlic and, occasionally, fish like cod. You can taste this specialty in any of the restaurants in Barcelona with sea views. An equally recommendable variant is the fideuà, which is prepared with thick noodles. This is a classic dish to try in Barcelona during Christmas. It has its origins in Italy; specifically, its invention is attributed to the composer Gioachino Rossini, who is said to be an accomplished chef. In the middle of the 19th century, this recipe for rolls of pasta with meat baked in the oven became fashionable among the Barcelona bourgeoisie. This tradition has persisted until today, becoming the star recipe of Sant Esteve (Saint Stephen’s day), on December 26 (the filling is made by reusing the meat of the stew that is served on Christmas Day). 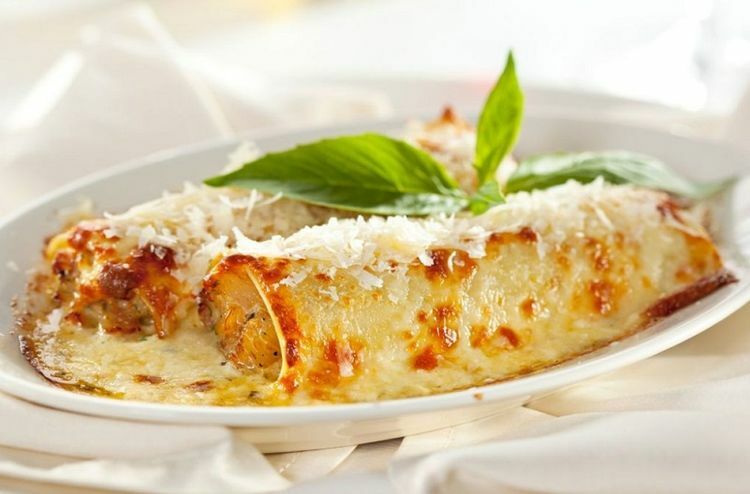 In addition, cannelloni accept many other variants: for example, replace meat with spinach or mushrooms, which makes this dish a great choice for vegetarians (and even vegans, if you use a vegetable béchamel). 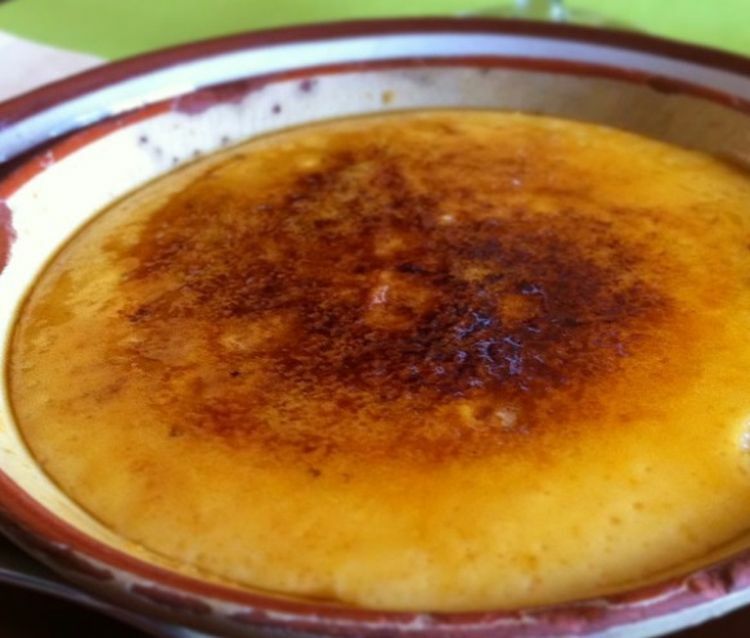 Known in France as créme brûlée, this dessert based on milk, egg, cinnamon, vanilla lemon zest and burnt candy coating cannot be missing from any table. And since the seventeenth century, it has put the finishing touch to endless gastronomic events in Mediterranean Europe and, of course, in Catalonia. This list could not end without mentioning one of the heavyweights of Catalan cuisine: coca. Sweet or salty, this bread dough has many combinations and ingredients. Among the most popular cocas, it is convenient to refer to the coca of Montserrat, baked in this beautiful mountain of impossible shapes, and of course, the coca of Sant Joan, the perfect culmination in the festivals that celebrate the summer solstice. 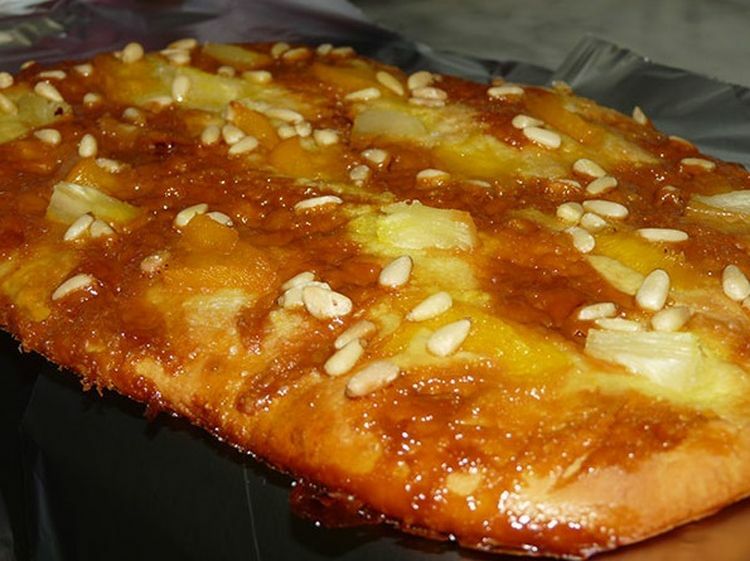 It is one of the Catalan desserts par excellence. 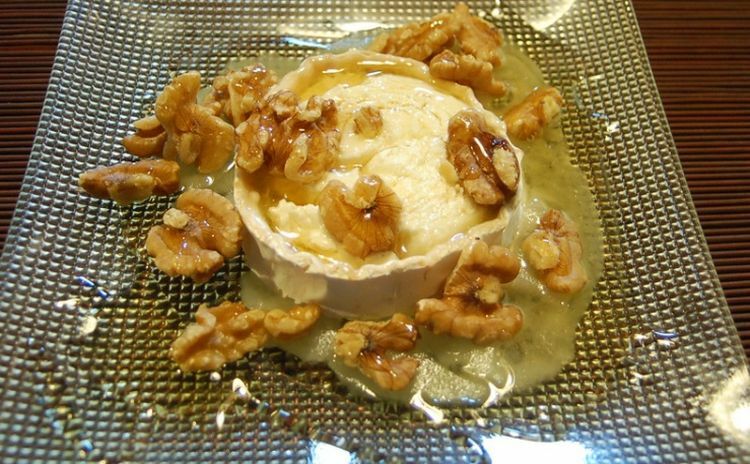 It is very simple to prepare, since it consists of coating a bit of cottage cheese or fresh cheese with honey (and if you like, with nuts). Can you think of a better option to finish your meals and dinners? What do you think of our culinary selection? Can you think of any other dishes to try in Barcelona? If so, we will be happy to recieve your comments. Wow! Calcots sound like something I need to try when I come to Barcelona. Do you know of any restaurants where I can eat such delicacy? Thank you for your comment. The first thing you should know about calçots is that they are seasonal. You will only find them in restaurants from January-February up until April-May tops. There are plenty of restaurants in Barcelona where you can eat them such as Maur Muntaner, L’Antic forn de Villarroel or Semproiana.